I am currently in the process of writing a primer of sorts on the fundamentals of a non-interventionist foreign policy. Because non-interventionism has so few spokesmen and such little institutional support, I think it is important to clearly articulate what exactly a non-interventionist foreign policy would look like. But as I have already disclaimed, I am not naïve and do not foresee a full blown non-interventionist policy being pursued anytime soon. In fact, I think if it does come about sooner rather than later, it will be the result of a severe financial crisis that forces a retrenchment out of necessity, not because those who support the reigning interventionist paradigm see the light. As someone who has been arguing in the trenches the case for non-intervention since before the First Gulf War, I recognize that non-intervention is a hard pill to swallow for many who have been conditioned to take interventionist presumptions for granted. For this reason, I have thought long and hard about whether there is a middle ground somewhere that would get us to a more reasonable and less bellicose foreign policy. In thinking about this question, I believe the foreign policy typology of Walter Russell Mead is helpful. I realize that some have criticized his typology, but I find it a useful framework for thinking about these questions. If you are interested in the subject of foreign policy, I suggest you familiarize yourself with Mead’s work. 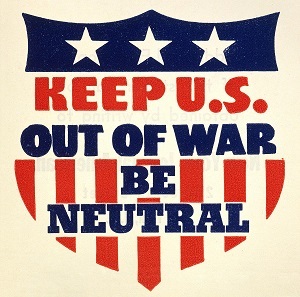 By Mead’s framework, neoconservatives, the bete noire of non-interventionist, are Wilsonians. They are foreign policy idealists who believe in using American influence and military might to actively spread American “values” around the globe and the necessity and desirability of the U.S. taking the lead role in ensuring the continuation of the reigning liberal world order. In my experience, a lot of hawkish conservatives are not actually idealists. They don’t concern themselves primarily with objectives like spreading democracy. They are more concerned with American safety and security which is best assured in their minds by defeating bad guys, not by converting them all to Western style liberal democracy. These types are best described by Mead’s system as Jacksonians. However, again in my experience debating these matters in the trenches, hawkish conservative Jacksonians quickly revert to Wilsonian talking points when pressed on the actual threat that whatever world situation is being discussed legitimately represents to the U.S. While not primarily motivated by ideals, they presuppose the necessity for the U.S. to play a grossly outsized role in maintaining the current world order and thus tend to see threats to our interests very broadly. Jacksonians represent a large segment of the population, but like non-interventionists they don’t have a lot of spokesmen or institutional support because most of the ideologically interventionist talking heads, institutions and outlets are Wilsonian. Some non-interventionists, likely realizing that consistent non-intervention is a tough sell, have taken to describing themselves and the foreign policy they desire as realism, but this is not an accurate characterization. Like neoconservatives, realists are a type of global minded interventionist. They take the current ruling foreign policy paradigm of the U.S. as the country necessarily primarily responsible for maintaining global order for granted. They generally don’t question the underlying premise. They are just more multilateralists, less prone to resort to military force and more measured in how much faith they place in the ability of military force to achieve our objectives. So realism would be an improvement from the standpoint of being less cavalier about the use of force, but it doesn’t challenge the status quo presumptions. I have come to believe that there is a greater opportunity for progress toward a more non-interventionist foreign policy through the route of America first Jacksonianism than through realism. As before, Jacksonians are not idealists and are not primarily concerned with spreading American “values” and are not necessarily ideologically committed to the U.S. as “essential” maintainer of the world order. They simply want to look out for the safety and security and interests of the United States. Therefore, Jacksonians can approach neocons policy wise when they very broadly define U.S. threats and interests without adopting the idealism or they can approach non-intervention when they perceive threats and define our interests less broadly. While Donald Trump’s foreign policy pronouncements and actions (such as his appointments) have sent a mixed message and make it somewhat hard to characterize his foreign policy views precisely, I think that Trump is best described as a Jacksonian with perhaps a bit of Hamiltonian thrown in. I boarded the Trump Train fairly early when I recognized the possibility that he could be a vehicle for the three “paleo” issues that have long set me apart from the mainstream conservative crowd – immigration restriction, opposition to globalist trade deals and a non-interventionist foreign policy – but I have never mistaken Trump for a non-interventionist. In fact, while always sympathetic to Trump’s campaign, I was initially reluctant to throw my enthusiastic support behind him because of his bellicose language regarding ISIS and the Iran deal. Neither ISIS nor Iran should be our concern. Trump’s general pronouncements on foreign policy, such as his inaugural address invocation of America first, have been more promising than the specifics (ISIS, Iran) and some of his appointments. What has been encouraging about Trump’s success is that he connected with rank and file Republicans and conservatives despite not being an orthodox interventionist. This supports my contention that many generally hawkish conservatives are not Wilsonian idealists. For example, Trump’s suggestion that other members of NATO need to start carrying more of their weight, did not alarm them as some sign that he had fundamentally wandered off the ranch on foreign policy. It struck them as a reasonable expectation of fair play and good business sense. Alarm over Trump’s NATO statements was confined to the interventionist establishment, right, left and center, and the type of movement conservative “three-legs-of-the-stool” ideologues who read National Review and voted for Evan McMullin. I was a supporter of Ron Paul in 2008 and 2012 and certainly favor his foreign policy over Trump’s, but there is a reason that Paul’s foreign policy alarmed Republican voters in a way that Trump’s did not. Despite the fact that Trump was explicitly questioning the current American led liberal international order, he was not judged by the GOP base as “weak” on foreign policy. This undoubtedly had something to do with Trump persona. He is not perceived as a weak person, but it was also because Trump’s Jacksonianish foreign policy is unfortunately more in sync for now with the average GOP voter than is Paul’s Jeffersonianism, to return to Mead’s typology. Those of us who support a non-interventionist foreign policy would do well to keep this in mind. To be clear, I am not suggesting that non-interventionists stop articulating our vision. We need to continue precisely because there are so few of us who are doing so. The point is to recognize what are and aren’t useful moves in our direction and to train our fire accordingly. As things stand now, calling for an America first foreign policy that serves American interests firsts and suggesting that our allies should carry more of their own weight seems the most likely path to a fundamental reshaping of our foreign policy because it plays well with the base while explicitly challenging the current paradigm. It is up to us non-interventionists to then whittle away at what the average voter views as legitimate threats to the U.S. and the extent of our vital national interests. This entry was posted in Conservatism, Donald Trump, Foreign Policy, Politics and tagged Foreign Policy, Non-intervention. Bookmark the permalink. 1 Response to Is America First Jacksonianism the Path to Non-Intervention?